On a typical product page on Amazon (say for a book), Amazon pulls 200-300 services to generate the page. Each service is managed by an Amazon employee and Amazon gives them the flexibility to build in the language and tools that best fit the needs of the service. 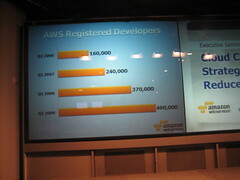 Here you can see the growth in registered developers for AWS. At least count it was 500,000 (I am one of the 500,000). 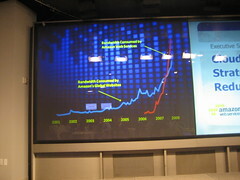 One of the interesting examples Werner provided came from the New York Times. They wanted to put all of their old editions online but didn’t want to utilize their current TIFF files as they were very large in size per page. They wanted to use PDF files instead. They had to convert 4TB of data and internally they looked at using 6 servers and a lot of hours of development. By using AWS, they got the project fully completed in a weekend and it cost $25 in EC2 processing and S3 storage. Check out all of my event photos on Flickr. Amazon S3 Down For Over Three Hours… and Counting!